Nimbus Themes / Magazine / Reviews / WooCommerce versus Shopify: Which Platform Better Suits Your eCommerce Needs? With trillions of dollars being spent each year on online purchases, it should come as no surprise that people are looking to get in on the eCommerce bandwagon in record numbers. And, because it is simpler and cheaper than ever to set up an eCommerce shop, the competition continues to rise. That’s why choosing the perfect eCommerce platform to sell your products and services is essential to making it in the world of online sales. There are so many things to consider when it comes to choosing an eCommerce solution: features, store management, design, shopping cart systems, blogging, SEO optimization, expandability, support, and of course, cost. That’s why today I am going to compare two of the most popular and widely used eCommerce platforms – WooCommerce and Shopify – to help you with this important decision. Deemed as one of the most customizable eCommerce platforms around, WooCommerce makes building an online business a cinch. In fact, WooCommerce is so effective, it powers nearly 28% of all online stores open for business right now. Giving you the ability to sell physical, digital, or affiliate products from a marketplace, the WordPress WooCommerce plugin comes packed with every feature you could possibly need to attract a wide audience, convert them into buyers, and retain them as long-term customers. Managing your store and customer interactions is easy with all of WooCommerce’s built-in management features. To start, add and manage products from the easy-to-use WooCommerce dashboard. Next, determine product types, enable thumbnail images, and set product variables for every item in your store. In addition, you can manage inventory, track stock levels, and even receive inventory emails to a custom email address. Moreover, you can manage customer interactions using the CRM features built into the WooCommerce plugin. For example, allow customers to register their own accounts, set automatic password selections for them, and even offer one-click refunds to decrease the hassle that often follows a customer complaint. Additionally, utilize the WooCommerce iOS app so that your online shop stays at the fingertips of your customers at all times. Since WooCommerce is a WordPress plugin, it is safe to assume that there are plenty of SEO optimized features built directly into the plugin. In addition, as WordPress is well known for being a blogging platform, you can rest assured that it too comes SEO optimized, regardless of what theme you choose to use. However, there are also some effective WordPress SEO plugins that make optimizing your site easier. For instance, Yoast SEO allows you full control over everything SEO related on your website, shop included. The WooCommerce core plugin offers flexible payment methods for collecting money from your customers. However, there is more to it than just taking people’s money. In the end, the goal behind WooCommerce is to ensure that store owners have control over every element that relates to their online store. The team at WooCommerce is dedicated to providing premium support for any paid-for product. Helping with things such as installations, configuration, and general use, they boast a 48-hour response time for first time replies. What’s more, WooCommerce makes submitting a help ticket super easy by allowing you to create a help ticket directly from your WooCommerce dashboard. In addition, WooCommerce offers thorough documentation that can help guide users who need help. And, since WooCommerce is an open source project, you can count on the extensive WordPress community to help at meetup groups, on online forums, through social media, and more. Shopify is a self-hosted eCommerce solution, meaning you do not need any additional software in order to get a shop up and running. Offering beginners a simple way to set up shop and start selling online, Shopify provides ways to sell from your website, social media shops, and even your own physical storefront. Shopify has an exhaustive list of store management features designed to make operating your online store easier than ever. For example, you can enjoy learning about customers through their personalized profiles, encourage repeat purchases with account creations, and even categorize customers based on location, purchase history, and more. In addition, take advantage of one-click order fulfillment, automatic inventory updates after refunds, and customized automated email templates to match your brand. More so, to make things simple for busy website owners such as yourself, Shopify enables shop management on your smartphone via the Shopify app. With it, you can manage inventory, fulfill orders, and even contact customers from your mobile device. Shopify is smaller than the world of WordPress, thus it has dedicated servers catering only to Shopify stores. Because of this, it is likely your Shopify store will load quicker and more efficiently than a store running on WordPress will, which of course makes Google happy. In addition, Shopify automatically generates a sitemap with products, webpages, and blog posts included, all of which help you to rank higher so you can be found by interested customers. Lastly, to really improve your chances of ranking higher in search engine results while using Shopify, you can optimize images, add Meta tags and defining titles, and even add product descriptions with high ranking keywords. Altogether, Shopify offers all of the features needed to run a successful online store with plenty of flexibility so you can cater to your customers. Shopify has a dedicated support team available to Shopify users 24/7. This includes email, live chat, or phone. In addition, there is a Shopify Help Center where you can find answers to common questions, utilize the user guides, and check out tutorials. You can also get involved with Shopify’s discussion forums and engage with fellow shop owners, visit the Ecommerce University for tips on selling online, and lastly work with Shopify experts (designers, developers, or marketers) to really make the most of your online store. Shopify offers three monthly pricing plans going for $29, $79, and $299. There is also a $9 shop plan for selling strictly from your Facebook social media network. Each plan comes with unlimited file storage and products, 24/7 support, fraud analysis, manual order creation, discount codes, and a free SSL certificate. Of course, there are additional features as you climb the pricing tiers. If you want to try Shopify, there is a free 14-day trial to see if it is the right eCommerce platform for you. In the end, there is so much more than meets the eye when it comes to the WooCommerce and Shopify eCommerce platforms. And the truth is, each one offers website owners a solid foundation for starting an online shop and provides plenty of features for making that venture a success. 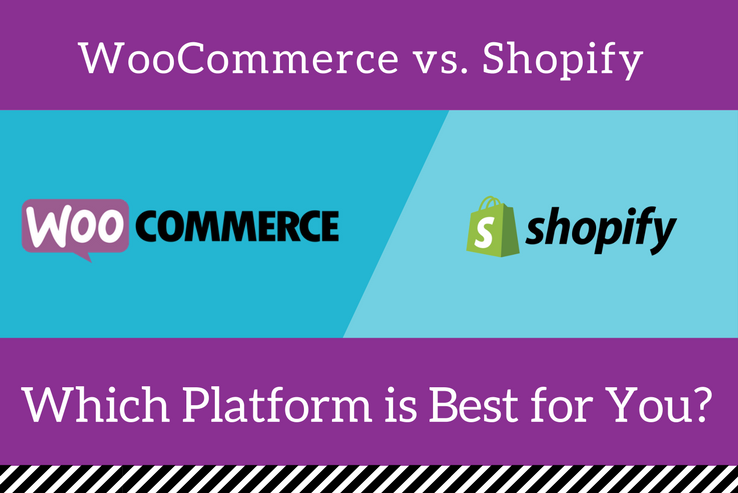 WooCommerce and Shopify are a close comparison when it comes to their main features. In fact, both are great solutions for setting up an online shop quickly and efficiently. It really just comes down to those minor differences and may end up being a matter of personal preference or budget. Altogether, regardless of which platform works best for you and your individual needs, you will surely attract more people, convert more buyers, and retain more sales as you build your online shop to become a success using either WooCommerce or Shopify. Have you ever used WooCommerce or Shopify for your eCommerce needs? I would love to hear all about it in the comments below!